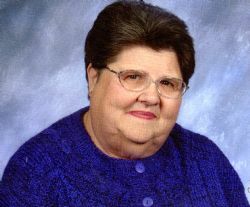 Patricia Ann Ruffin, 80, of West Memphis died Thursday, June 28, 2018 at her home in West Memphis. Mrs. Ruffin was a member of the First Baptist Church of West Memphis, and a retired Cosmetology Instructor. She is survived by her husband, Cecil A. Ruffin, three daughters, Sheila Oakley, Barbara Curtis and Cindi Maglothin all of West Memphis, a brother, Steve Hammerstone of Chickamauga, GA: four grandchildren, Jeremy Tolleson, Josh Oakley, Amanda Maglothin and Sarah Maglothin, two great grandchildren, Bradley Tolleson and Abby Oakley. Click Play below to view the Video Memorial for Patricia Ann Ruffin. If you would like to order a DVD copy of the video, please contact the funeral home at 870-735-1000.